This node creates a terrain using a Ridged noise generator. 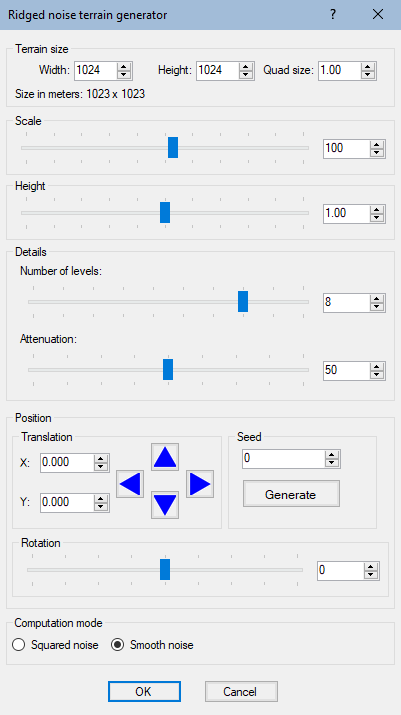 It is a standard modification of a Perlin noise generator node where each level of detail is transformed using the opposite of the absolute value function. It creates sharp discontinuities and patterns that resemble crests and ridges. This noise is usually used to create sharp mountains. To add a Ridged noise node, right click in the Graph Editor and select Create Node > Terrain Transformation > Ridged noise. A larger coefficient increases range of the height of the vertices. A smaller coefficient decreases range of the height of the vertices, as shown in the example below. Attenuation: This corresponds to the attenuation of a level of detail against the previous one. If this value is low, the high-frequency levels of detail dominate and generate a high-frequency noise, as shown in the example below. If this value is high, the high-frequency levels of detail are less visible.